Google has set up a pop-up display area at the Moscone Center in San Francisco for this week’s Game Developers Conference. Google’s investment in streaming is no secret. Last fall, the company’s Project Stream beta allowed users with high-speed internet connections to play Assassin’s Creed Odyssey in a Chrome tab. Rather than processing the game’s graphics locally using a high-end PC or gaming console, Project Stream ran the game on Google’s servers, allowing users to play the game by downloading data on the fly—aka streaming. It’s not a new technology, but past stabs at it have fizzled mostly because of latency issues, a problem that Google’s decision-makers think they can solve thanks to the data centers they’ve got all around the world. 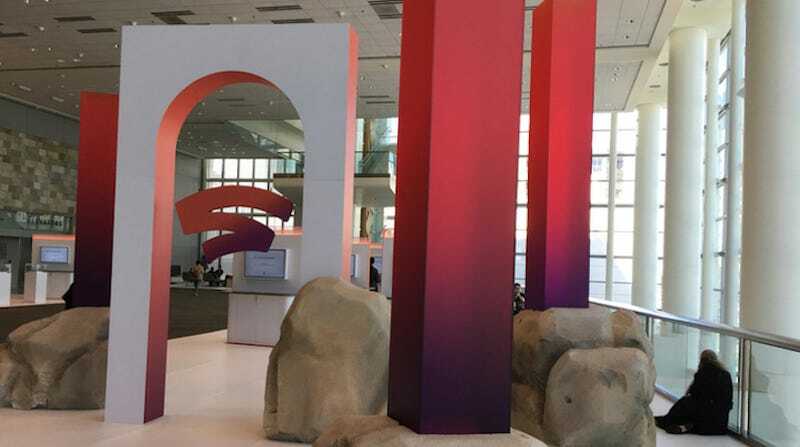 It’s the platform’s bells and whistles that may be the wildest part of tomorrow’s big keynote, which takes place at the Game Developers Conference here in San Francisco at 10am Pacific Time. Google’s streaming platform won’t just allow you to play high-end games on low-end hardware. What we’ve heard from several people who have either been briefed on or heard about Google’s plans is that the platform is full of ambitious ideas. One scenario that’s been described to us by three different people (each of whom either heard about it secondhand or directly from Google), for example, might look something like this: You’re watching your favorite Twitch streamer play a game and you think it looks cool, so you buy it, and then, if the developers of the game have toggled this feature, you can download a save file that starts you off right where your streamer was playing. Or maybe it’s a multiplayer game, and you can buy the game and immediately jump into a match with the streamer, if the developers allow it and the streamer is down. What we don’t know is exactly which games we’ll see at Google’s keynote, what else might be unveiled there, and what other features the streaming platform may have. We’ll get the full picture at 10am PT tomorrow.